Of course, Sherlock Holmes is in the public domain and available from such sources as Project Gutenberg, but now Simon & Schuster is launching a complete edition that has the benefit of professional editing. A lot of the editions on Amazon, for example, are a bit rough and could use a professional touch. Since the new edition is free, you might as well give it a try. 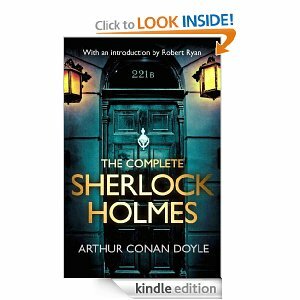 In addition, the new edition has an introduction by Robert Ryan, and his “… own book has been fully endorsed by the Conan Doyle Estate. A big Holmes fan himself, he will undoubtedly provide a fascinating new look at the detective ….” Ryan is the author of a novel about Watson’s war in Flanders, Dead Man’s Land. I’ve downloaded the Amazon edition of the collection and it is very nicely done, much better than some of the freebies that I’ve tried in the past. It will remain in my permanent library.